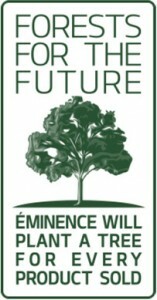 One tree will be planted for every Eminence product sold! Imagine if your daily skin care routine could contribute to keeping our planet beautiful. By choosing Éminence Organic Skin Care, you can do just that. Eminence is thrilled to announce a new environmental initiative: one tree will be planted for every product sold! Every time one of our active organic or Biodynamic products is purchased, a portion of the proceeds will go towards planting a tree to help clean up our air and support the world’s natural resources. Our new partnerships with award-winning global tree planting organizations like Trees for the Future and our longstanding commitment to protecting the future of our planet through green practices, Éminence is rebuilding and restoring our environment one product – and now one tree at a time. Produces approximately 260 pounds of oxygen per year! Absorbs as much carbon in a year as a car produces driving 26,000 miles! Helps lower air temperature and helps prevent climate change! Stabilizes the soil and prevents wind and soil erosion through its roots! Contributes to the fertility of land through nitrogen fixation and increasing water penetration!